Posted on Friday, February 15th, 2013 at 5:30 pm. 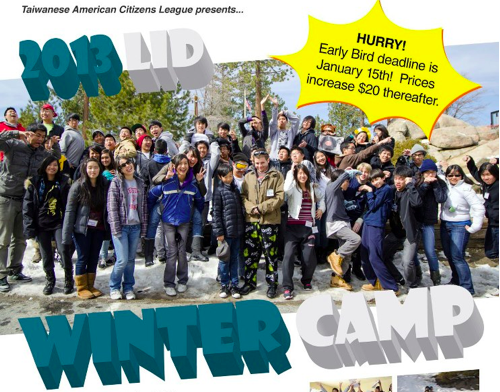 Students from 7th to 12th grade are invited to attend the Taiwanese American Citizens League – Leadership, Identity and Development (TACL-LID) winter camp this February! Come and learn about Taiwanese culture and history, gain valuable leadership skills, ski and/or snowboard, and participate in fun outdoor activities! This is a great opportunity to meet new friends and learn about Taiwan, so invite your friends to come along too! LID camp encourages youth in the Taiwanese community to celebrate their cultural identity at an early age. At camp, not only will they learn about their heritage and community, but also actively participate in them by engaging in history and culture activities. Our program imbues a sense of belonging to the Taiwanese community. Through small group interactions, campers learn about rich Taiwanese culture together, develop teamwork and leadership skills and form life long friendships. Camp produces leaders at every level- from middle school, to high and to college. With over 20 years of history, LID is a seasoned program with a strong positive effect for our campers. We help encourage and support their paths to succeed for the future. You don’t have to be Taiwanese. All we ask for is a camper who wants to have fun, make new friends, and have a willingness to learn about Taiwan!